This entry was posted in Events on January 29, 2014 by Admin. 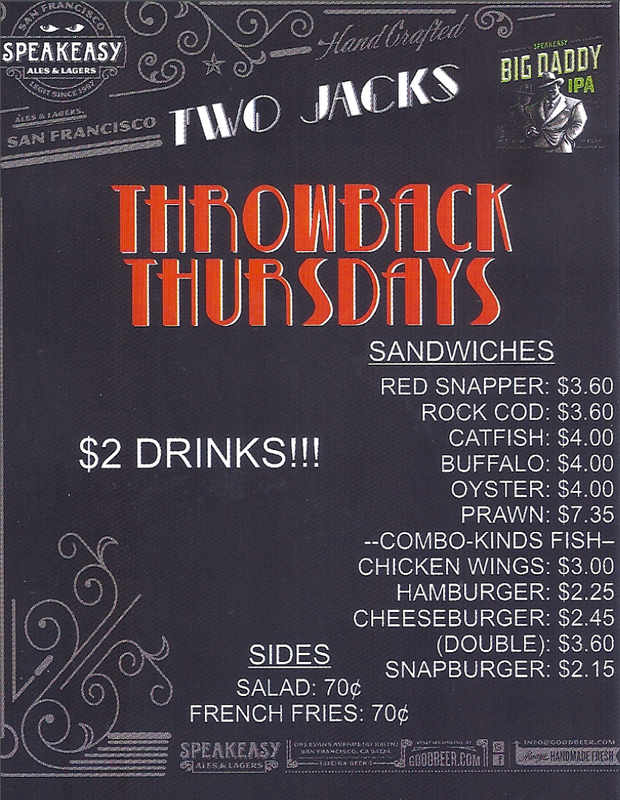 Two Jack’s Nik’s Place is celebrating is introducing Throw Back Thursdays! Starting Thursday February 6th we are kicking off our #tbt happy hour by throwing back our prices to our original 1977 menu that is hanging up in our Haight Street location. Come and enjoy all your favorites for 1977 prices from 4-7 pm, as well as $2 drink specials and 80′s and 90′s soul. Now if you can’t make it on Thursdays we are also doing Secret Saturdays from 4-8PM. Check on our Facebook page or this website for the secret password and unlock the old menu prices, it’s that simple! !